…And so began my work with Eat Street Buddha Kitchen and Lounge, a new Asian inspired restaurant that opened up on September 30th, 2013. This project was very exciting and very different than what I have been used to! It was fascinating to see the transformation of the dull, dingy space (which was the former Azia restaurant on the corner of 26th and Nicollet) into something so beautiful and trendy. It was even more exciting to watch the executive chefs create their outstanding menu and be able to sample all the dishes after we photographed each plate! Best gig benefit ever! Their menu is unbelievable! From specialty cocktails, small plates, sushi rolls, salads, entrees…all the way to brunch! Oh, did I mention that I got to sample all these items? It was great to finally meek Mike Tupa, who is Buddha’s owner. He owns several other restaurants including, six Wild Bill’s Sports Saloon, which I photographed in the past for his company. He has a wonderful staff beneath him who I was able to get to know personally. The staff of Buddha is fabulous! It was fun to watch them create the exquisite food in the kitchen and have fun doing it! PS – Grant LOVES to do dishes. While I have proof of this in my photos, I promised him I would not post it! Jhade Smith was behind the creation of the trendy and beautiful cocktail menu. She handmade syrups and purees for her “on the rocks” and “served up” drinks. ....and many other good choices! A behind the scenes note: We had to reschedule the cocktail menu shoot from the original scheduled date because while Jhade was packing up her car with all the flavored vodkas, gastriques and purees, the box of ingredients slipped and crashed all over her driveway. As if sampling the menu during my photo sessions was not enough, I was invited to a VIP dinner for their soft opening. “You’re exclusively invited to experience the newest restaurant opening in Minneapolis!” WOW – what a great invite. Sure, I would love to come have a free dinner of some of the best food ever! Here is the invite I received, which features my photos! My husband, his parents and I headed down on Friday, September 27th for a wonderful meal! We agreed to each get a different entree so we could share! This experience has been amazing, thanks to my friend, Velinda, for giving me the opportunity. I look forward to working with them again! Make sure you visit them soon and order something from above. Fall is approaching! It is time for fall colors, warm sweaters, hot chocolate and my first ever fall/pumpkin themed mini session! The month of October is almost completely booked, so this is a great way to get your family in quickly. Bring your kiddos in their cozy fall clothing (or their Halloween costume) – anything goes! 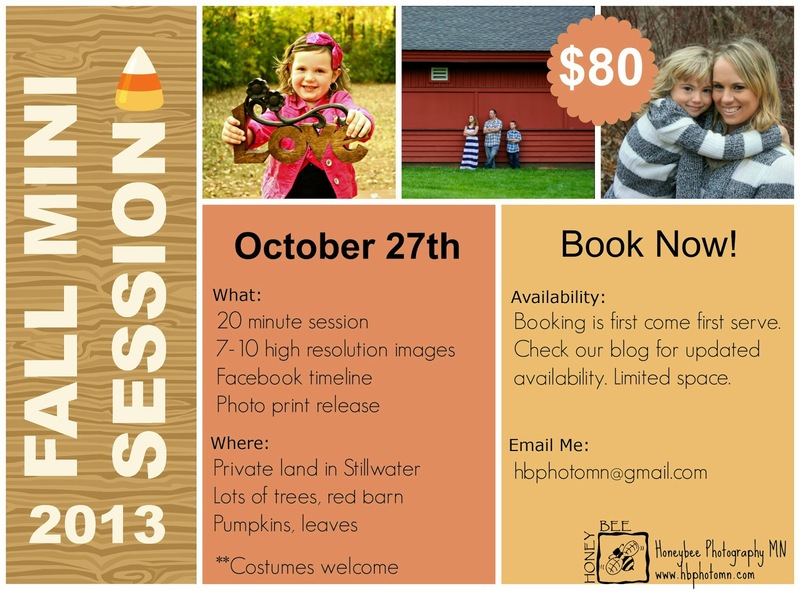 The sessions have been rescheduled to October 27th, 2013 and take place at a private farm in Stillwater, which features lots of trees, leaves, old barns, pumpkins and other fall décor. Each session costs $80 and includes 20 minutes with one photographer, 7-10 high resolutions digital images, one Facebook timeline image and a print release. Returning Client: A $20 discount is being offered to families who had a full session with us in 2013! Sweaters, scarves, hats, jeans. The best colors to wear are blues, denim, khakis, creams, browns, greens, reds and oranges. Costumes are welcomed and encouraged. Once your booking deposit has been paid, you will receive an email with more details about the sessions (what to expect, where to go when you arrive, etc.). Booking deposit is non-refundable; however, should you need to cancel your appointment, the $25 fee may be applied to another session in 2013 or 2014. Mini sessions are quick, casual and cute. It is a great way to update family portraits, capture a special phase in your child’s life or just because! These mini sessions can be used for anyone you would like…baby, siblings, couples, etc. Several back-to-back sessions will be booked on this day, so it is important that you are on time for your appointment. *Inclement weather: In the case of rain, we will plan a new date and work with you to reschedule your session for a convenient time within two weeks of original dates…but PRAY for no rain! 1:00pm – Booked: Rachel B. 1:30pm – Booked: Jamie I. 2:00pm – Booked: Jamie I. 2:30pm – Booked: Melissa S.
3:00pm – Booked: Melissa S.
3:30pm – Booked: Teri G.
4:00pm – Booked: Stephanie H.
4:30pm – Booked: Chantelle S.
Photos will be delivered within 4-6 weeks from your session. **Because of the mini time-frame, these sessions are for up to 4 people/pets max (of the same family). There is a fee of $15, for each additional person OR you will need to book two back-to-back sessions. The mini session cannot be used for engagement, newborns or cake smashes. Refunds will not be given for any reason.